Over the weekend, I was discussing the state of the unsigned/underground side of hip hop with my man Bless 1. The emergence of MySpace and YouTube during the past couple of years has significantly lowered the barrier to entry into hip hop, giving just about anyone who's ever seen 8 Mile an audience to listen to their (often clumsy) first steps towards MC status. This of course has led to more than a few regrettable songs being unleashed onto the internet, yet when it's done right, "indie" hip hop is far and away more original and more interesting than what's passing for mainstream rap these days. It may not always sound as polished as what the major labels are offering, but as mainstream rappers continue their evolution towards fully-commercialized caricatures of real MCs, the underground has picked up the torch for true hip hop and run with it. One label that has been putting out the kind of independent hip hop that I'm referring to is Chicago's Rhyme City. Run by J-Direct's Griff (previously featured here), Rhyme City has quietly been putting together a stable of talented rappers. Griff recently hooked me up with his label's latest mixtape, Welcome To Rhyme City Volume 1, showcasing all of the Rhyme City artists (along with a few guest appearances). For those of you who have been visiting this site for awhile, there should be some familiar names on this mixtape. 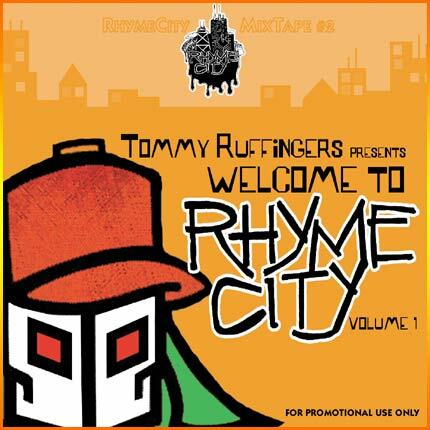 Clean Guns, Sosay, J-Direct and Mr. Lif are all featured on Welcome to Rhyme City, along with several other artists (many of whom I have to admit I was not familiar with, though they all come correct). For more information on Rhyme City, head on over to their website.